I’ve always drawn circular patterns, ever since I was a little kid. My About page has some examples of circles done for various projects over the years. Here’s a modern nature-inspired mandala. Is it meaningful that the center is empty, if that’s supposed to be the most important element? 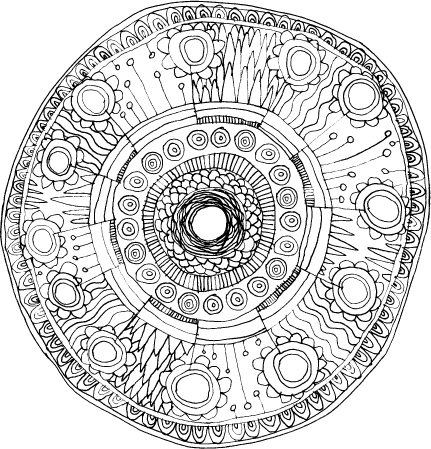 I’ll have to try to imbue my next set of mandalas with more conscious meaning. This entry was posted on February 25, 2008 at 11:59 am and is filed under bw, discussion/analysis, floral, mandalas, nature. You can follow any responses to this entry through the RSS 2.0 feed. You can leave a response, or trackback from your own site. Thanks for sharing this amazing work! you’re a true artist!